It’s snowing. Again. MAKE IT STOP! TOMORROW IS MARCH! MY PARENTS ARE GARDENING! STOP SNOWING! “Where’s the apple butter?” Eric called from the depths of the refrigerator. “I think we finished the jar last time,” I said. He went and got another one from the pantry, opened it, began spreading it on our toast. (That leaves four.) “I’m so glad you like apple butter,” I said. Yesterday, while helping Eric shovel snow (he had his mom’s snowblower, I had the shovel and the broom, so I started and assisted but he did the bulk of the work), I went into the herb garden. It was, of course, all white. I sketched out some beds and paths in the snow; I still haven’t figured out exactly how everything’s going to be laid out, and I’m feeling like I won’t until I get in there and start digging. But I think I’ll have room for everything I want to put there. Maybe. Did I mention I have four kinds of basil and eight kinds of lettuce? Importantly, I noticed a low slushy spot where the rainpipe comes down from the roof. This may or may not be the source of the occasional wet basement floor we get (much better than before Eric cleaned the gutters, though). I would never have noticed the spot if not for the slush. But now I’ve noticed. And I thought: rain garden! I had planned to put non-food plants near the house anyway, for fear of lead in the ground, and didn’t I pick up a brochure on rain gardens at the TBG? I have coneflower and butterfly weed seeds, what else do I need? Because I need another project, you know. There’s a level 2 snow emergency in effect today, with more snow coming down. It is a fuzzy-sock day–which is to say, a day in which I put on a pair of my beloved fuzzy socks because I’m not going anywhere that day. I have remote access to my work e-mail and it’s been slow anyway, so I’m going to enjoy the unexpected day off. One of the things I’m going to do is winter-sow some blanket flower my friend Carol gave me. I only remembered I had it when I pulled out my oatmeal tub of purchased seeds, my Ball jar of saved seeds, and my paper bag of Seed Shop seeds and sat down to organize them. I annexed a plastic container of Eric’s that he had been using for photographs, added dividers (Alliums, Brassicas, Cucurbits, Flowers, Greens, Herbs, Legumes, Roots, Solanaceae, and Other–and yes, I alphabetized them, except Other which should always go in the back), and sorted. Happily, the seeds just about fill the container, and when planting is done this year it will be considerably emptier. Of course it’ll fill back up in the fall and winter, but that’s okay. I hope this is the last snowstorm of the year. It’s getting very close to March, and March is a time for snow to stop, I think. That’s my considered opinion. The broccoli is up! Two of them, anyway. The one on the left is Sorrento broccoli. And it’s purple! The one on the right is Romanesco Green Goliath. 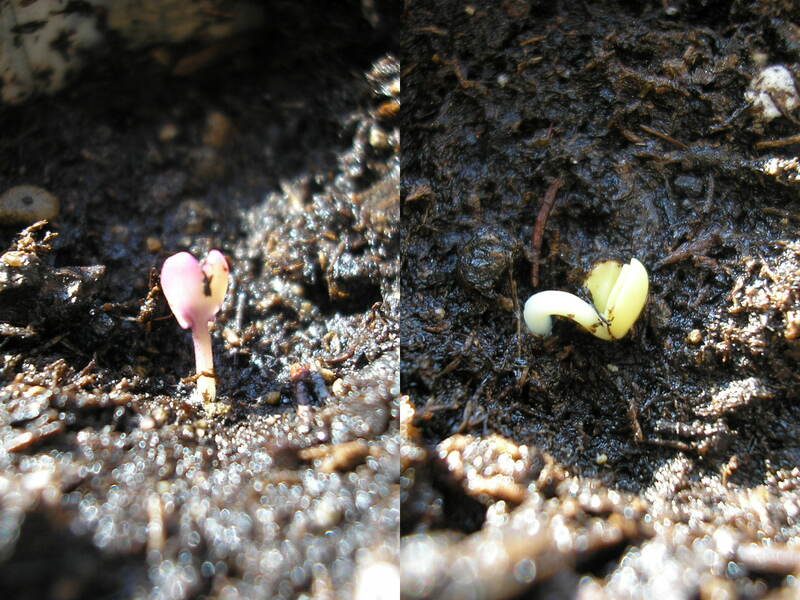 Go, seedlings, go! The Toledo Botanical Garden is right on the edge of a fairly busy section of town, next to Reynolds, one of the major thoroughfares of Toledo, close to the freeway, just south of Central with its auto row and multitude of shops. Find your way to the TBG (and, indeed, ‘find’ is the operative word–it took me three tries to figure out how to get in, the small signs not helping, and I ended up walking from the farthest parking lot to where I was supposed to be because I was too exasperated to drive) and you’re suddenly outside the city. The trees block any view of residential or commercial neighbors; the stream floats along serenely; the carefully kept gardens are well-organized without being sterile; the underlying structure of the place is more apparent in winter, but doesn’t detract from the scenery. I went to the flower/herb room first and picked up a brochure on rain gardens, and read that there will be an herb sale in May. “Hi,” said a woman at one of the tables. I said hi back, and she said, “I saw you at the herb sale, right?” I shook my head. “That’s funny. You look so familiar. Oh well.” She flapped her hand, dismissing the issue. “Another plant-lover.” The place was mobbed, so I left and went to the main room, the vegetables. The vegetable room was also mobbed, but being bigger it was more bearable. The tables were laid out by category: roots, corn, assorted flowers (the flowers in the flower/herb room were mainly natives), tomatoes, beans/peas, squash, greens, and Help. The tomatoes were going fast, the beets and corn not so much–“Five for a ticket!” the lady there said. “We have so many, and we were told we could give deals after we heard the lettuce was going two for a ticket.” I picked up five kinds of carrots (one packet of Scarlet Nantes should have counted as five all on its own, judging by its weight) and one kind of beet, Chioggia. I had only a vague interest in growing beets, but I’ve never had one, so I might as well try at least a few. Add one to my Growing Challenge list. I got five squash for a ticket, too: yellow scallop, Zahra hybrid, Stella Blue Hokkaido, Crookneck, and Waltham Butternut (I already have butternut seeds, but I’m not sure about the whole inbreeding depression thing, since they’re from just one plant, and I sure as heck wasn’t getting another summer squash). I got six types of lettuce (two for a ticket), plus arugula and Blue Curled Vates kale and cutting celery (!) and Miner’s Lettuce, which I won’t grow because it’s purslane, only I didn’t realize that at the time. I got Delectable corn, which I noticed because it had been sprayed with bright red fungicide, and the woman at that counter waxed enthusiastic until I gave in and said I’d take a bag. “Have three!” she said, taking my one ticket. I got peas and onions and turnips and three kinds of melons and Chinese cabbage (another one for the Growing Challenge) and some flowers and a couple of pumpkins for Edith and Michelle. I went back to the flower/herb room and found them almost cleared out, but did get some red-leafed basil and considered the fennel until I remembered it tastes like anise. With my last ticket I got some Principe Borghese seeds. The packet says 45% germination in 2006, so I’m not terribly hopeful about these, but I figured I might as well give them a try. Altogether I got thirty-seven varieties. This was twice as much as many of the people there got, but with half, especially for free, I would still have been exceptionally pleased. Many of the seed packets were marked “Toledo GROWs,” and this turns out to be the TBG’s community garden outreach program. I went to the Plant Propagation talk after the seed frenzy, and had hoped it would discuss, say, dividing, grafting, and cuttings, but it was mainly on seeds for vegetable gardens. They’re trying hard to get people to grow their own plants; I think that’s the main purpose of the Seed Swap or, as I shall call it from now on, Seed Shop. It wasn’t really swapping, and in fact the man at the pea/beans table told me not to take a clearly homegrown packet because “who knows how they grew it, or what year?” I think that’s why I only picked up the one pea and no beans at all. But I do think the concept of a vegetable-garden outreach is marvelous. I wish I were staying here longer so I could help–but then, I’m sure there will be something similar wherever we end up next year. If there isn’t, I’ll help start it, because this was wonderful. Of course, now that I’ve got thirty-seven new types of seeds, almost all of which I want to plant, I’m trying to figure out what happened to my garden plans, especially the seed-saving parts. I have this dreadful sense that I’m going to stick to my planting schedule but have to improvise as far as how much, and where, and which to plant at each specific date. I don’t like this feeling of my plan being derailed…but then, I do like this feeling of having so much to grow and try. The last cranberry seedling is curling up and dying. Poor thing. There go my cranberry dreams, until next fall at any rate. The eclipse two nights ago was beautiful. I could absolutely see interpreting that as a sign from the gods, of good or evil, whichever side I cared to be on. It is very quiet on the garden front these days. February is depressing me more than it has ever depressed me before, with the snow and the cold and the ice and the more snow (and it doesn’t help my morale when Eric gets up, checks the computer, says, “Two hour delay! Yeah!” and dives back into bed as I’m struggling to gather up the willpower to leave the soft warm bed for the cold bleakness that is the weekday morning). The broccoli pots are just sitting there, which is fair since it’s been less than a week. The scallions from Mom’s garden are in fact coming up now, bend double and yearning toward the window. I turn them every day. The lemon tree is still, slowly, blossoming out, trying to remind me to keep my chin up. The sage plant on the back steps, when not covered in snow, is a wrinkly gray shade of itself. Spring is coming, I know. I was planting things outside last March. I’m waiting. Even in the rest of my life, I feel like I’m waiting. Now, this may be part of my personal psychological issues, or my inherent laziness, or both. But maybe no matter why I think I’m waiting, how or when or what for, what I’m really hoping for is spring. Coming home from Andersons, after he only-half-jokingly apologized for not knowing whether the beef he bought was local (did I mention I got him to read Animal, Vegetable, Miracle? ), Eric and I discussed pasta sauce. We love Trader Joe’s basil marinara, you see. It’s tasty, it works as pizza sauce, it costs $2 a jar. But Trader Joe’s is an hour away, and gas is expensive. “Could we make our own version?” Eric wondered aloud. “How much do tomato plants cost?” Eric said. “Essentially free pasta sauce would be essentially awesome,” he said. The sauce is mostly tomatoes; tomatoes are mostly water; a quart of sauce is tomatoes somewhat thickened; call it two pounds per quart. We use pasta sauce for pasta, for lasagna, in pizza, in occasional other things. Call it a jar a week on average. In the summer we can make fresh; but the rest of the year, we’ll need to can our own. Call it forty weeks’ worth. We also need tomatoes for other things, like gazpacho (“Mmm, gazpacho,” Eric said, looking into the distance. “With our own tomatoes, our own cucumbers, and our own peppers.”) and ratatouille and salsa. And drying. That’s eighty pounds of sauce, plus some unknown number extra tomatoes. I want to try canning salsa as well, and we like gazpacho. Call it a hundred and twenty pounds of tomatoes, all told. With ideal conditions, tomato plants can apparently produce up to 100 lb. of fruit in a season, but the average is more like 10 lb. This means I need at least to grow 12 healthy tomato plants, other than the grape tomato, preferably mainly ones that aren’t too juicy and will therefore be good for sauce. “We need to work on our pickle recipe too,” Eric fretted. The sesame seed jar was to form a mold for the newspaper pots I intended to make. My friend Carol recently told me that she didn’t like hers, but hers were smaller and with fewer layers of newspaper. Mine are crude, but fairly rugged…I think. At any rate, we’ll see as the season progresses. 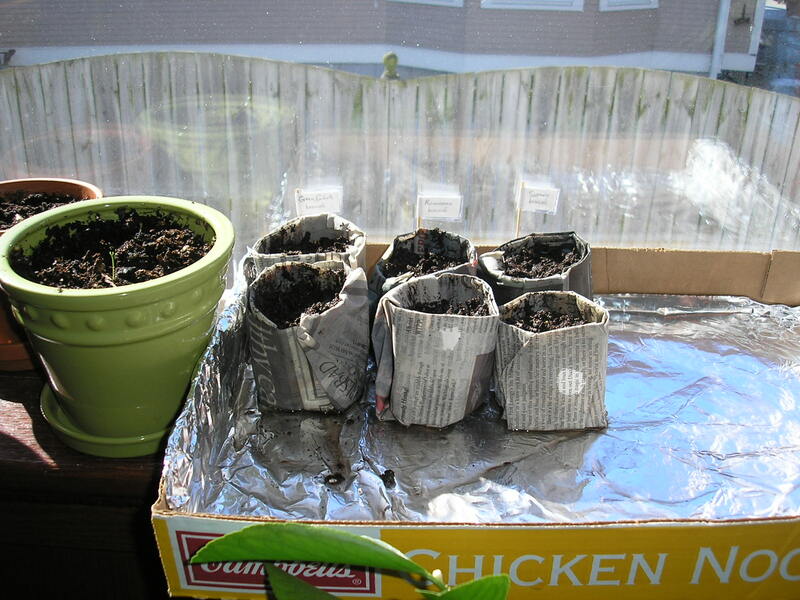 I was originally set to plant four pots each of the three types of broccoli I’m growing: Green Goliath, Romanesco, and Sorrento. Because, you know, four plants doesn’t seem like too many. Then I reminded myself that this is all broccoli and while we like broccoli around here, we don’t like it that much, and I plan to grow other things this spring as well. So I cut it in half. Two pots of each type, and if I’m weak, I’ll add another pot or so each in a week or two in the pretense that I’m doing succession planting. But I’m really just putting some spring on my windowsill. The Swap and all workshops are free and open to the public! Come to the Garden on Saturday, February 23, 2008 to exchange seeds, learn new skills and diversify your gardens. No matter your gardening ability, you’ll enjoy the chance to mingle with other gardeners and swap favorite seeds and bulbs. The Seed Swap gives gardeners the opportunity to enjoy new plants and to help preserve unique local and cultural strains, as many gardeners grow plants that are unique to their ethnicity or taste. Visitors are also encouraged to bring houseplants to exchange. There will be activities for kids, workshops, music and more so bring the whole family. For more information, please call (419)936-2975 or email tgrows2@toledogarden.org. The Seed Swap is a free/grassroots event. Hmm. I still have some seeds I could trade. “Gardening for Maximum Nutrition” sounds intriguing…so does “Plant Propagation,” come to that. And I think Eric has a gamercon that weekend, so I’ll have some time to myself anyway. I still feel like too much of a newbie to contribute, but I know that’s not true–I have seeds, and I have interest, and I would love to meet some local gardeners. Today is the day to pull out my first seeds for planting (only I think I’m going to do it tomorrow–planting seeds, to me, requires sunlight, even if I’m starting them indoors), so I think I’ll take stock of what I can offer.